Children and animals make the most precious combinations. When these two adorable creatures meet, the result can only be something amazing. One organization is taking advantage of this dynamic duo with an innovative new program. 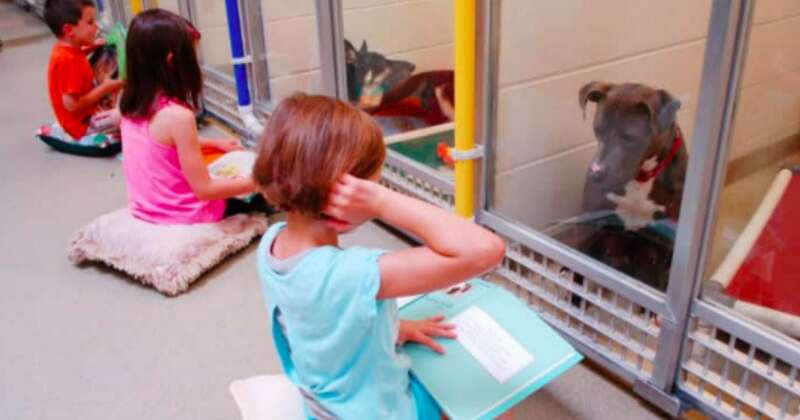 The Missouri Humane Society has launched a program that allows kids to read to the dogs who are stuck at the shelter. 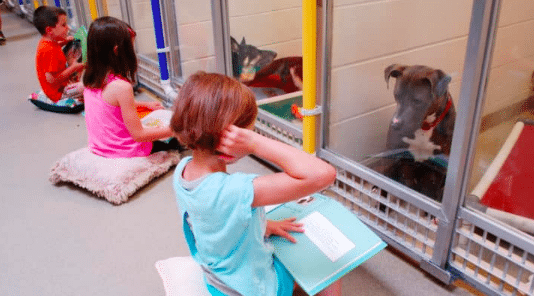 The project, known as Shelter Buddies, was designed to help children practice their literacy skills, and it just might be the most brilliant idea out there. Sometimes kids who are learning to read are shy around other humans. They don’t want to suffer the embarrassment of being wrong, so they don’t read as often as they would if they were in a more comfortable environment. This program is the perfect solution to that problem. 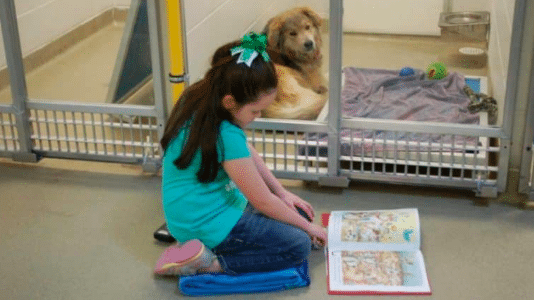 Instead of reading aloud to other people, which can be quite intimidating, the kids can read to the dogs who stay at the shelter. 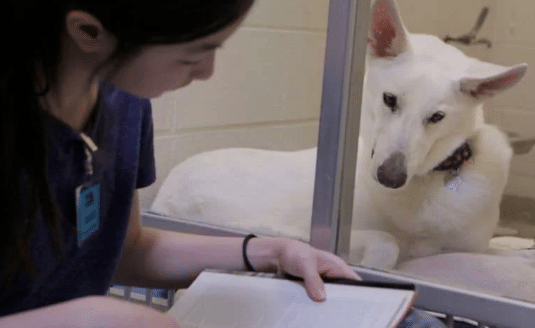 Dogs are so loving and nonjudgmental – they make the perfect audience for a practicing reader. Not to mention they aren’t literate themselves, so they will never be critical! Of course, as a project of the shelter, this project was designed to benefit the dogs too. Pups who are waiting to be adopted don’t get to interact with humans nearly as much as they would like to, if at all. This genius program completely changes that. Now the dogs get to hear the soothing voices of humans as the kids practice their literary skills. Being around a person and feeling their good energy is soothing to the animals. Since it was introduced, the Shelter Buddies program has drastically reduced the dogs’ anxiety. This is especially essential to the dogs’ well being, because being a shelter animal isn’t exactly a walk in the park. Many of these beings were rescued from horrific circumstances, and they spend a great deal of their time hoping to never be stuck in the same situation again. As much as the people who work with the dogs would like to, they are simply unable to give these creatures all the love and attention that they deserve. They work with limited space, finite resources, and tight budgets. The best hope these pups have of thriving is to be adopted, so until then these reading sessions serve as a window of bliss in a sea of fog. These regular interactions help both parties involved to improve their social skills. The more the dogs are around humans, the more calm and sociable they will be. That way when they finally meet their forever families they will be ready to go home with them. It helps the kids to become more social as well. They are able to be around the other program participants, so they become more accustomed to being around other children while focusing on a specific task. Not to mention that although each kid is reading to a dog, the child is around the other kids reading. This will make the idea of reading in class seem much less scary. The kids are able to bond with the dogs at a young age and gain a unique appreciation for animals. Some psychologists say that you can learn a lot about a person based on the way they treat other creatures, so developing these positive interactions at an early age will help to shape the children into more compassionate and responsible individuals. This program is pure genius. I wish all the animal shelters would do something like this! This system is designed so that everybody wins – the children AND the dogs. 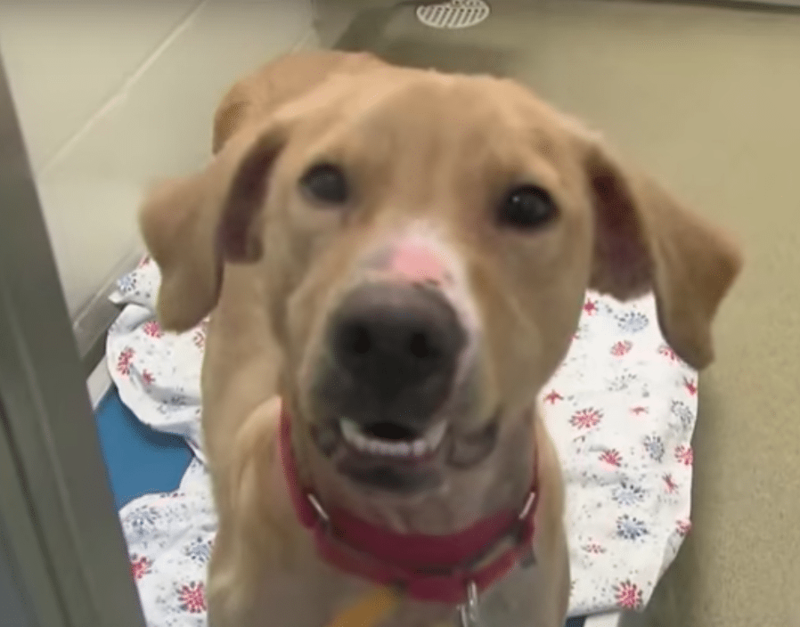 If this program inspires you, talk to your local animal shelter about doing something similar.